It was Saturday morning, November 17, and the cross country team was on its way to the 2018 California Community College Athletic Association State Championships at Woodland Park in Fresno, CA. Northern California was in the midst of the devastating Camp Fire that had already burned through thousands of acres. Not knowing if the race would be postponed due to the unhealthy air quality, 18-year-old freshman Grace Hoffman sat back in one of the teams travel vans and tried to mentally prepare. Forty-five minutes before the race, an official deemed the air quality safe for the runners, and they were off. El Camino College’s women’s team placed 11th in the race. EC’s cross country head coach Dean Lofgren said Grace Hoffman led the ECC women with her 32nd place time of 19:36 over the rolling 5,000 meters course. This is Grace Hoffman’s first semester at EC and she is pursuing a nursing major. Just a few months ago, she was deciding between other colleges that she was accepted into before she graduated high school, however, they weren’t her top school choices and she didn’t want to settle. Grace Hoffman didn’t choose to come to El Camino until this past April or May while in her senior year at El Segundo High School. She wasn’t even sure she was going to run at EC until she came and toured the campus with her dad last spring. “I came [to EC] with my dad…and then we stopped by the track and we ended up talking to Dean [Lofgren] for like an hour and a half about cross country and about my dad and my aunt and different things,” Hoffman said. Grace Hoffman’s dad, Gregg Hoffman, was a student at EC back in 1984, where he was a member of the men’s cross country team that won the state championship in ‘84. “It’s been really cool for me [to watch Grace]. I’ve been to several of the meets which brings back memories for me,” Gregg Hoffman said. He is happy that Grace Hoffman is having a great experience here at his alma mater. After their conversation with Lofgren that day, Grace Hoffman decided she was going to attend El Camino and join the cross country team. “After talking to [Lofgren] for a long time and seeing how he ran the program, it changed my mind about if I wanted to run or not,” Grace Hoffman said. 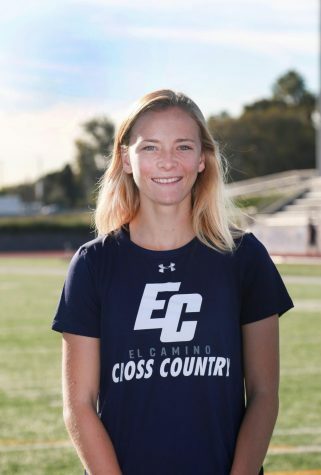 Gregg Hoffman said that Grace’s decision to come to El Camino and run was a “happy surprise.” The two have been able to share a similar experience in attending EC and both being a part of the cross country and track and field teams. Grace Hoffman has played sports her whole life. When she was younger, she played volleyball and roller hockey. Once she got to high school, she realized she wanted to join the cross country team, but she had to choose between volleyball and cross country since they are both played in the same season. “My sister had [ran cross country], and I come from a family of like a bunch of cross country runners,” Grace Hoffman said. So the decision was easy for her. “Overall, I’m super happy that I chose to do cross country rather than volleyball just because it taught me a lot and I made a lot of friends too,” she said. Grace Hoffman comes from a big family. She has four siblings and is the middle of five, with two older sisters, a younger brother and a younger sister. 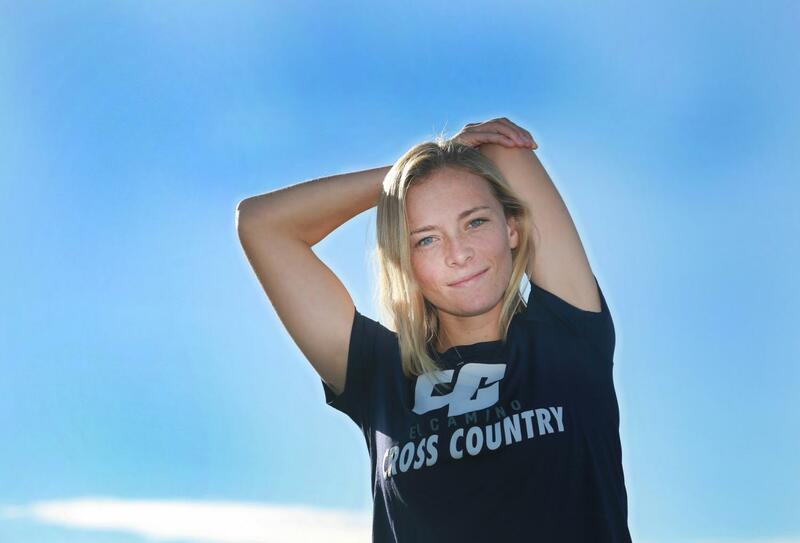 She believes that cross country is a very competitive sport, maybe even the most competitive in her opinion, and that’s one of the aspects she loves about it. “If you’re in a race and neck and neck with someone, it’s about who wants it more because you know that both of you are extremely tired and it’s just about who’s more competitive, who’s willing to push it to the very end,” Grace Hoffman said. Long distance running is not easy, and although she loves her sport, there are times where she has to talk to herself, and moments of pain that she pushes through. Grace Hoffman is very dedicated to her sport, training nearly six days a week with the team, and sometimes on her own on the weekends. There is a camaraderie between her and her teammates, the men’s and women’s cross country team at EC. Grace Hoffman said that pretty much every week, on the night before a race, the team gets together for a pasta dinner. “We’ll come together at someones house, eat pasta and hang out, and after races, we’ll all go get lunch together,” Grace Hoffman said. Now that the season is over, Grace Hoffman said she took a break, just one week off to allow her body some recovery time. After her rest, she’ll start to slowly build up her stamina again. During the winter, in January, she’ll start training with the cross country team again. In her free time, she enjoys hanging out with friends and family, she likes to sleep, and sometimes she indulges in Netflix shows like “The Office”, “New Girl”, and “Dexter”. 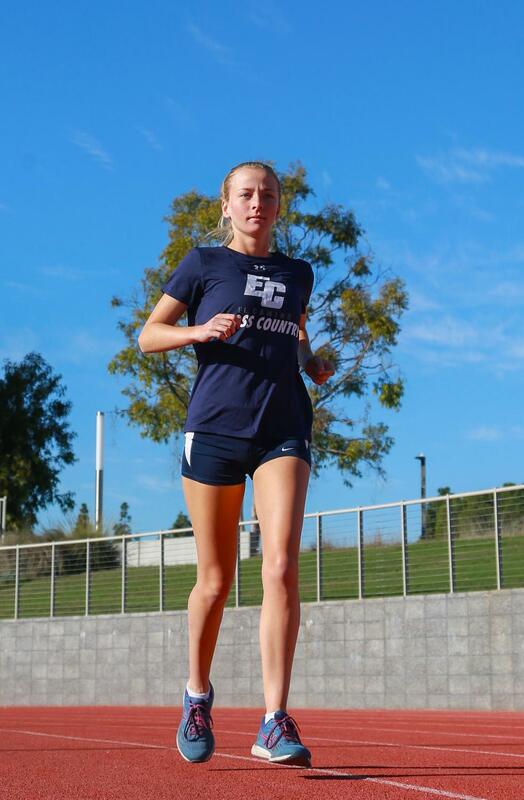 This spring, Grace Hoffman will participate in EC’s track and field, another familiar sport, where she will focus on the 800 meters and the 1500 meters. Grace Hoffman said she’s happy she chose to come to El Camino and continue running. She has plans to finish her nursing degree and she’s fully committed to continuing to run. “I knew that I hadn’t reached my full potential yet and I still don’t think that I have [this season], but I still have time,” Grace Hoffman said.